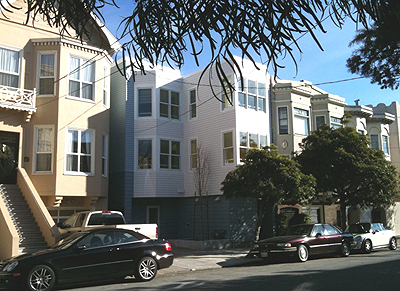 Sam Davis Architecture (formerly Davis & Joyce Architects) is a Berkeley, California firm with four decades of housing experience. Working with institutions, market-rate and non-profit developers, and service providers, Sam Davis Architecture has designed housing for a wide range of people, many with special needs. The firms projects include those for families, students, seniors, young people with HIV/AIDs, homeless youth, and homeless adults. The firm has won many design awards and competitions and the work has been published in the United States, Great Britain, and Japan. Sam Davis is Professor Emeritus of Architecture at the University of California at Berkeley where he taught from 1971 until 2009. He served as the Interim Dean of the School of Social Welfare on the Berkeley campus (2011-12), as Interim Dean of The College of Environmental Design (2008-09), as Chair of the Department of Architecture (1993-96), and as Associate Dean of the College of Environmental Design (1998-2002). He has written three books on housing, The Form of Housing, The Architecture of Affordable Housing, and Designing for the Homeless: Architecture that Works. He received a Humanities Research Fellowship from the University of California and a Guggenheim Fellowship for his work on homelessness. Sam Davis is a graduate of the schools of architecture at UC Berkeley and Yale. He became a Fellow of the American Institute of Architects in 1985.